Everybody knows Cate Cahill and her sisters are eccentric. Too pretty, too reclusive, and far too educated for their own good. But the truth is even worse: they're witches. And if their secret is discovered by the priests of the Brotherhood, it would mean an asylum, a prison ship—or an early grave. Before her mother died, Cate promised to protect her sisters. But with only six months left to choose between marriage and the Sisterhood, she might not be able to keep her word . . . especially after she finds her mother's diary, uncovering a secret that could spell her family's destruction. Desperate to find alternatives to their fate, Cate starts scouring banned books and questioning rebellious new friends, all while juggling tea parties, shocking marriage proposals, and a forbidden romance with the completely unsuitable Finn Belastra. It's about sisters, who are witches.. yup, that's all I need to know about this book! I (juhina) LOVE witchy books! We also love the cover design, it is so vivid in colors and very pretty. February 7th can't come fast enough!! What are you waiting on this wednesday? Waiting on Wednesday is a weekly event, hosted by Jill at Breaking the Spine, that showcases upcoming releases that we are excited about. OMG! 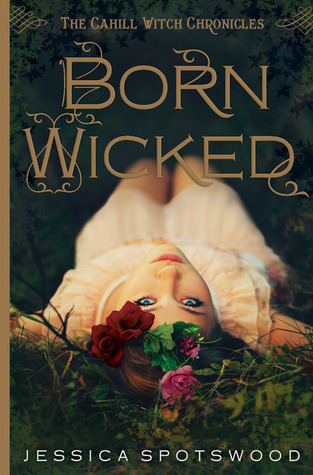 We have the same book as Wish Wednesday and I love witchy books too. Maybe we can hv some sort of Witchy feature or something. Looks great, and it goes without saying that that is a gorgeous cover. Thanks for sharing! This sounds amazing! Can't wait to read it. Great pick! I want this one as well. This one looks so awesomely cool and exciting. Great pick. It seems like I've had Born Wicked on my list forever now. It's sounds so good and the cover is fabulous. Eek I'm so excited fro this one too. Just the cover alone makes me want to read it! Baha. Awesome pick ladies!